In a rather stunning post, Joe Henry has announced that it is time for his family to move on from Garfield House in Pasadena, where JH has been planting his production roots since around 2007. I’ll let you read his heartfelt words and ponder them in due course. However, if you would like to fund one of the last productions to be held at Garfield, check out the new Kickstarter-funded project from Birds of Chicago. As it happens, the duo entered The Garfield House today, with JH at the helm. The project incidentally reached 100% funding today, but you can still chip in to help the band reach their stretch goals. This fall will see the release of a very intriguing 2-disc compilation of Civil War-era tunes, recorded by some fantastic artists. Joe Henry will contribute "Aura Lee" — and maybe some production work on the other tracks? Read more about Divided & United and hear Loretta Lynn's contribution here. You may recall that Joe Henry has played a significant role in a string of vinyl and digital releases benefitting ex-Replacements guitarist Slim Dunlap. JH and much of his regular wrecking crew have already contributed to tracks by Steve Earle and Lucinda Williams. 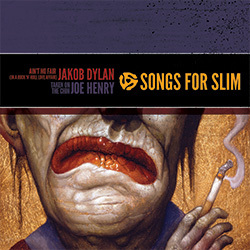 This month we’re excited to announce a single with fantastic tracks from Jakob Dylan of The Wallflowers and Joe Henry. Dylan and his crack band of A-list LA session players (Jennifer Condos, Jay Bellerose, Greg Leisz, Keefus Ciancia and Val McCallum) offer up a rollicking, bluesy interpretation of “Ain’t No Fair (In A Rock ‘N’ Roll Affair),” a classic Slim rocker and crowd favorite. Recorded in North Hollywood and produced by Joe Henry, “Ain’t No Fair” also features a guest appearance by John Doe (X, The Knitters) on backing vocals. Speaking ofJoe Henry, his work over the last three decades has made him a favorite of discriminating music fans worldwide, distinguishing himself both as an ever-evolving solo artist and an in-demand producer. He’s also been a key part of the Songs For Slim project; his contributions as producer for several of the SFS releases have been invaluable. This month he takes center stage for an impassioned reading of “Taken On The Chin,” Slim’s mournful journey to the dark side of life. Henry delivers a stunning vocal performance as he and a slightly different batch of fab session-eers (David Piltch, Jay Bellerose, Val McCallum, Greg Leisz, Patrick Warren and his son Levon) masterfully create a piece that hits the listener straight in the gut with an emotional wallop that won’t soon be forgotten. It’s brilliant on every level. The auction for this latest vinyl release is now closed, but all of the mentioned tracks are available digitally on iTunes (link, link, link). Next month will feature a John Doe track, which I strongly suspect will feature JH behind the boards once again.